The push/pull/legs split ( PPL) are one of the most simple and proven workout schedules around. It’s also one of the most intelligent and effective. There are a few different versions of it that can work well, and a few different ways to structure it over the course of the week (some of which are definitely more or less ideal for certain goals and situations than others). Each group is trained separately on its own workout day. 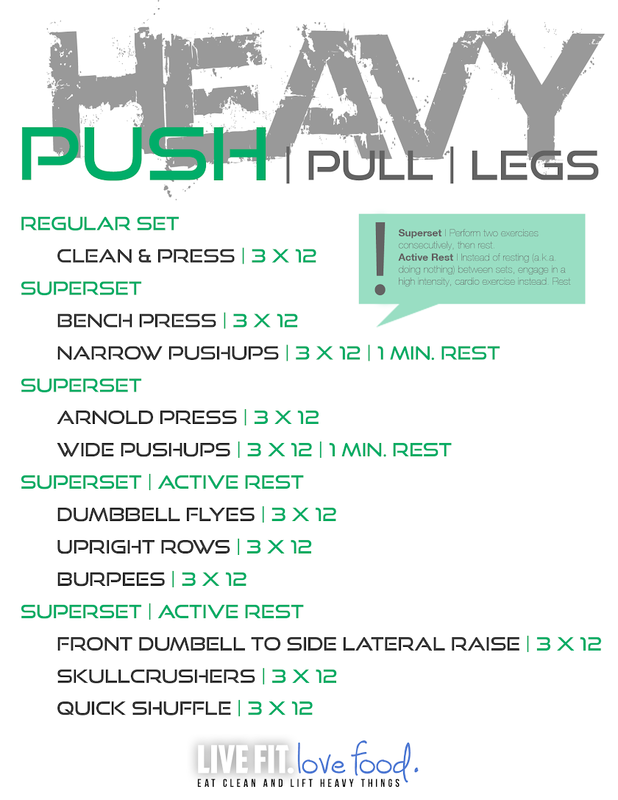 The “push” workout would train all of the upper body muscles that are involved in pushing exercises. The “pull” workout would train all of the upper body muscles that are involved in pulling exercises. The “legs” workout would train the entire lower body. The main purpose of splitting the body up this way is that related muscle groups are trained together in the same workout. By pairing up all of the muscle groups that get trained indirectly during exercises for other muscle groups, the push/pull/legs split greatly lessens that potential and the overall structure of your routine. As for how the workouts are scheduled over the course of a week, there’s a few different options. Let’s now take at look at the 2 most popular ones and see which is most ideal for you. There are 3 total weight training workouts per week done in an every-other-day format with 2 days off at the end. This makes this by far the most convenient and easy-to-schedule version of this split. This also means that each muscle group is trained just once per week (or once every 7th day). This is where this split starts to become not so good. That it is the least effective weight training frequency. It can still work if everything else is done right. It’s just not what works best for the majority of the population. While this classic version of the push/pull/legs split is terrific in terms of convenience and easy scheduling, it’s not good in terms of training frequency per muscle group/exercise. I wouldn’t really recommend it if you are looking to build muscle, increase strength or improve performance. A once-per-week frequency like this is actually suitable if your primary goal is to mostly just maintaining muscle and strength you currently have. As you can see, it’s either 4 or 5 total weight training workouts per week (it varies due to the “rotating” aspect of it… but it ends up being 4 days per week the majority of the time) using a 2 on/1 off/1 on/1 off format that repeats every 6th day. This increases the frequency from once per week (every 7th day) to about twice per week (every 5th day). This is the most effective training frequency for virtually everyone who is intermediate and advanced trainees. For just building muscle and looking awesome, I think this split is great. That’s why it’s one of the split options I use within my own training. The fact that this split is done over a rotating 5 day cycle means the days you do and do not work out on, will constantly change from one week to the next. This lack of stability could be a very big problem for many people from a scheduling standpoint. It’s allowing us to reach that optimal training frequency we want to reach, but what it has in training frequency, it lacks in convenience and ease of scheduling. This split can also be done with the workouts in a slightly different arrangement. Specifically as push/legs/pull instead of push/pull/legs. Both versions are equally effective, and this modification is mostly only relevant when using my preferred rotating 5-day-cycle version. However, there are a couple of small differences and reasons for making this change. Push/Pull/Legs ensures that the “legs” workout (which is typically the hardest/most physically and mentally demanding workout of the week) ends up always having a rest day before and after it. The downside is that the “push” and “pull” workouts are always done on back-to-back days. Push/Legs/Pull pretty much eliminates ALL potential issues. The main downside here is that the “legs” workout no longer has that nice rest day before it. 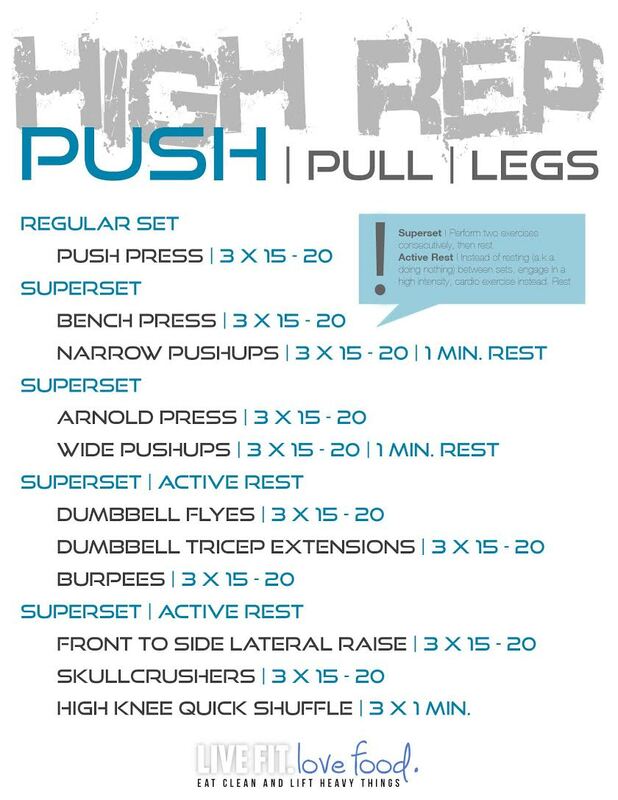 The post Push/Pull/Legs Weight Training Workout Schedule For 7 Days appeared first on GymGuider.com.